We have signed the Safe Seed Pledge. No GMO. All of our plants are raised on an organic diet of Fish Emulsion and Seaweed, with Beneficial Insects used for pest control. We ship Live Plants by UPS from April through early-June. Or, pickup at the nursery from mid-April through May 31st. Our Live Plants are grown in 2.5 inch by 2.5 inch by 3.5 inch deep plastic pots. 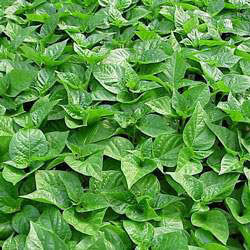 Plants average 6-8 inches tall (habaneros 4-6 inches), and have strong sturdy stems. This is a nice transplant size that has a great root system to produce fast. We guarantee that they will arrive safely! Our Live Plants are really getting to be known nationwide. We ship out over 130,000 plants a year, so we have lots of practice on getting plants shipped safely to your garden. These are super healthy large transplants, that produce abundantly. If you want the strongest, healthiest plants on the Web, that produce abundantly, you have come to the right place. You'll be amazed at our plants. Our Fresh Chiles are sold by the half-pint, shipping Sept - early Oct. This is a great way to taste-test some new varieties, with next year in mind. See which varieties of Fresh Chiles we're growing this year. PLEASE don't plant too early! Don't look at the calendar. Look instead at the thermometer, at night temperatures. Plants grow at night. Plant when night temps are above 55-60 degrees for peppers and eggplants, 50-55 degrees for tomatoes. This means planting in May for most of the country. Young plants hate cold feet, and will perform poorly if planted early. It is better to plant 3 weeks late, than 1 day early. When nights are warm, young plants thrive. When nights are cold, young plants catch a chill, growth is halted and plants become more susceptible to disease. Plants always do better when the night temps are warm. No young plants like cold and wet. Please also think about the plants' time in transit. If the box is subjected to very cold outside temperatures, the plants inside the box will be damaged. Here are our Safe Delivery Weeks. This is the earliest that we will guarantee safe delivery to your area. We can ship earlier, but you will need to sign off on liability if plants arrive cold damaged. Plants shipped on our very first ship date will be the youngest/smallest plants of the season. These plants may need to have a bit of extra care, and will not be as large as those shipped later in the season. Not sure when to plant? Check out our Safe Planting Date Map. Please read and follow our planting instructions which will accompany your order, paying special attention to slowly acclimate these plants to your garden. Never open the box and plant same day!! !